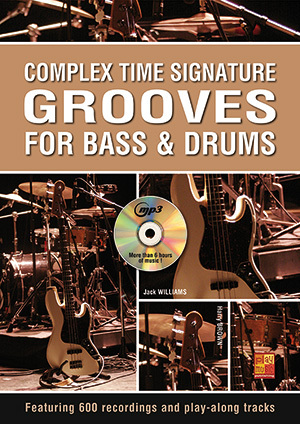 Complex Time Signature Grooves for Bass & Drums (DRUMS, Coursebooks, Harry Brown & Jack Williams). In today’s context made of cultural mix and encounters, the greatest musicians, whatever the style (pop, rock, progressive, metal, jazz-rock...) are more and more eager to look for new sources of inspiration, especially among world musics where there are plenty of asymmetrical melodies. The role of the rhythm section being above all to provide stability to the melodic instruments, bassists and drummers of all backgrounds should definitely practise these unusual patterns, necessarily less obvious than the standard 4/4 that our ears are used to. This is precisely the purpose of this book methodically explaining the essential rhythm concepts and detailing asymmetrical grooves in simple and compound meter, asymmetrical grooves based on eighth notes then on sixteenth notes, and concluding with the new perspectives offered by this practice. The accompanying MP3 CD will allow you not only to listen to the bass and drums examples but also to practise your instrument over the corresponding play-along tracks. For this purpose, for each example you get three different recordings: the bass and drum demonstration, the drums play-along track for the bassists and the bass play-along track for the drummers.